Serendipity Blackmagic / Megarip 6.0.01 includes an improvement to Ink Separation Control in Paper Profiles, allowing greater control over the influence of light and standard inks across printer process ink channels. The Separation Control tab displays graph describing the interaction of light and standard inks within the process CMYK ink channels. The graph shows the proportion of each ink used at ink coverage levels, inks start points and cross over within each colour channel. Ink Separation Control is available when the Paper Profile is linked to a printer Media with the ‘Use light inks’ and ‘Treat Light Inks as Separate Channels’ options enabled. (see Media > Output panel > Custom Settings). To view individual inks on the graph, click the colour checkbox at the bottom of the screen. 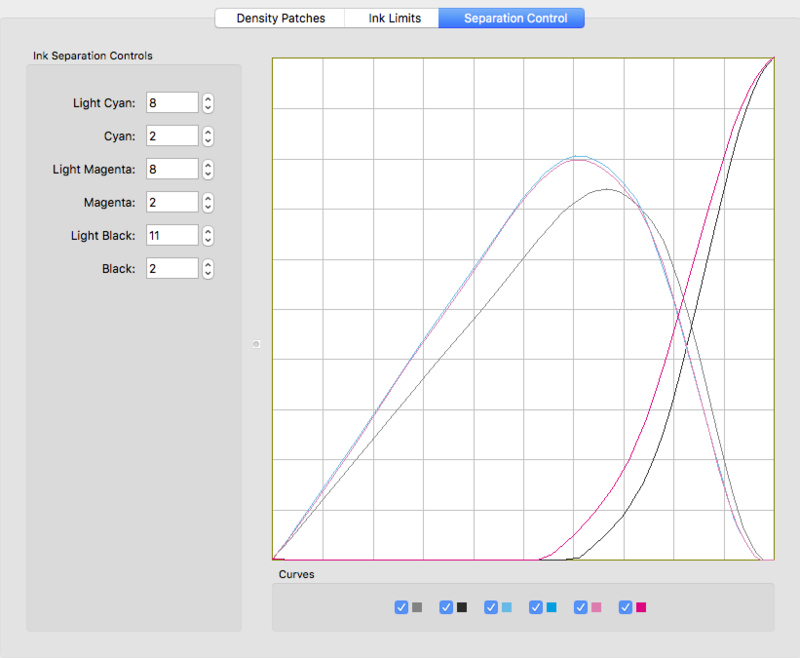 Double-click an ink to toggle all graphs on and off. Shift+click to display multiple selected graphs. The Inks for which separation control is enabled are listed on the left of the Separation Control panel. Fields beside each ink allow the user to adjust the influence each ink has within it’s colour channel, e.g. the Light Cyan and Cyan inks within the Cyan channel. These numbers are set to 0 by default, in which case the separation is controlled automatically. Increasing the influence of a light ink increases the amount of light ink used at higher coverage levels and pushes up the start (and crossover) point of the standard ink. Increasing the influence of a standard ink increases the amount of ink used at lower coverage levels, lowering its start (and crossover) point, and pushing down the end point of the light ink. This entry was posted in Blackmagic, Megarip, Serendipity Client, Workbench and tagged Version 6.0+. Bookmark the permalink.